Candles and photo frames are often spotted across my house, for me these two little things add the finishing touches into making my house feel like home. There is no better feeling then curling up in front of the TV and warm blanket and a burning candle filling the air with a heavenly scent. I came across Landon Tyler over on Instagram and a fellow blogger Stacey mentioned them over on her blog a couple of months ago (Check out her review!) After reading her blog post and seeing how gorgeous it looked I really wanted to get one. When the lovely people over at Landon Tyler sent on out for me to review I was so excited and couldn’t wait for it to arrive. The candle comes in a beautiful cream box with silver detailing and finally printed with a green label. Firstly the candle is huge, I think its 35 hours of burning time plenty of time to enjoy the scent. It’s presented with three wicks in frosted glass. I’m so happy about that I recently just finished a candle that looks like there is so much product left but it only had one wick so it just burned down the middle. I’ve been enjoying the candle for little over a week and I love it so much. It fills our room with warm smell of rose and jasmine. I think this scent is lovely for the time of the year, Christmas is over and it reminds me of what’s just around the corner. Spring. They have 12 different scents to pick from, they also have diffusers and beautiful hand wash sets to suit each and every individual. Check there full range here. I’m really impressed with the quality of the candle and they are also reasonably priced. I think this would make a lovely gift for anyone especially a house warming gift. After looking through their website they have really nice gift sets. With mother’s day not far away, I’m going to be picking some of these up for our parents. 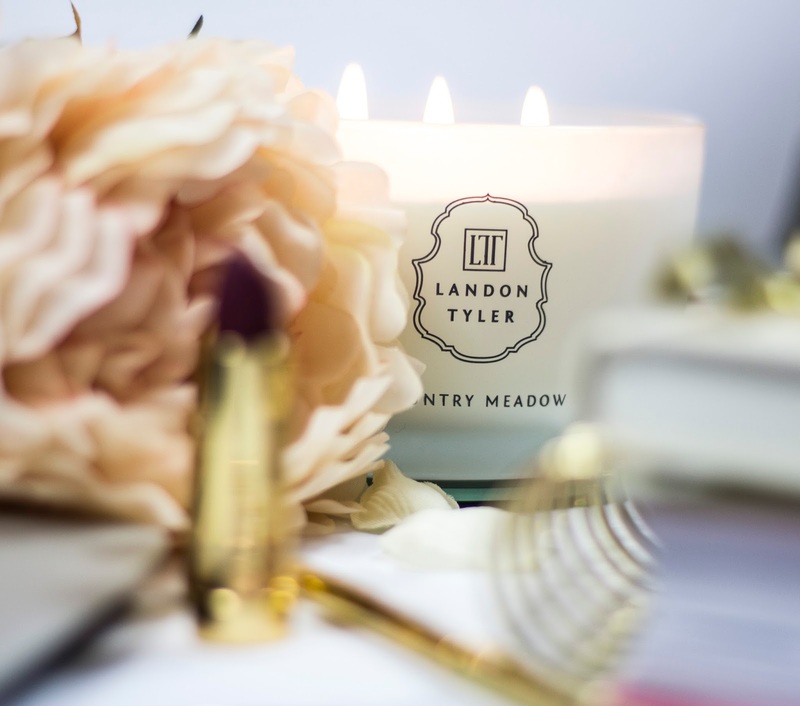 Have you tried any of the Landon Taylor scented candles? I’m already on the hunt for my new one, I’m thinking of buying pink cashmere. I love the sound of it. Ohh I've never heard of this brand before. I'm addicted to candles so always looking to try different brands so can't wait to get my hands on some of these! What a gorgeous photo, Tania! 😍 I completely agree that little touches like frames and candles really make a place more homely! This candle sounds divine, I'd really love to try out the pink cashmere scent as well! If it's a candle related review of course I'm going to love it. Its just an added bonus that it's so pleasing to the eye! Thanks for the mention! great review! I was obsessed with my candle, the aroma literally fills the room! I totally agree there's nothing better than being cosy with a candle on, they really make a home! This one looks so beautiful, I've never heard of the brand before! What a lovely candle and your photography is amazing! I´ve never tried their candles but I really want to know! I love candles, especially 3 wick ones! This looks so lovely.